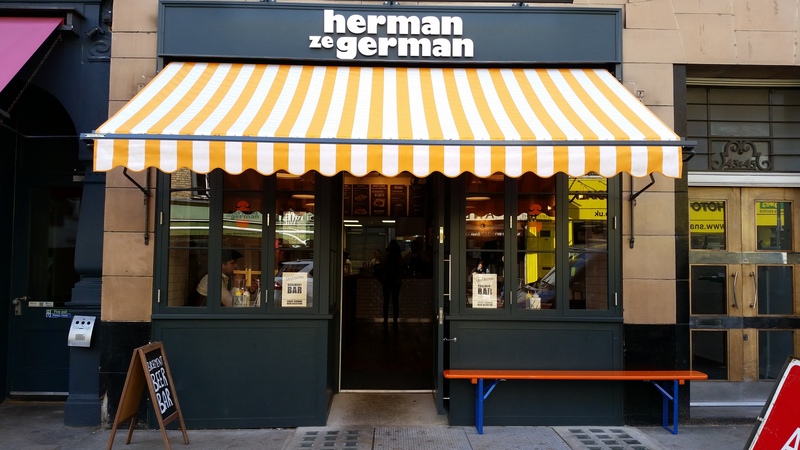 charlotte street is home to a few new eateries, and the newest branch of german sausage shop herman ze german is one which i was very pleased to welcome into the hood. having heard about their top quality sausage offerings, i was intending to pay the soho branch a visit sometime soon, but was saved the trip to soho by the appearance of a new branch of theirs just a stone’s throw away from home in my fave fitzrovia; hurrah! herman ze german occupies a nice little shop space next to yog along charlotte street. it is simply decorated but very warm and inviting – wooden floors, chairs, and little knick knacks and pictures adorning the walls with punny catchphrases and unabashed use of the word “ze” that make you giggle. there are a few tables on the ground floor and more in the basement which make for plenty of seats to go around. 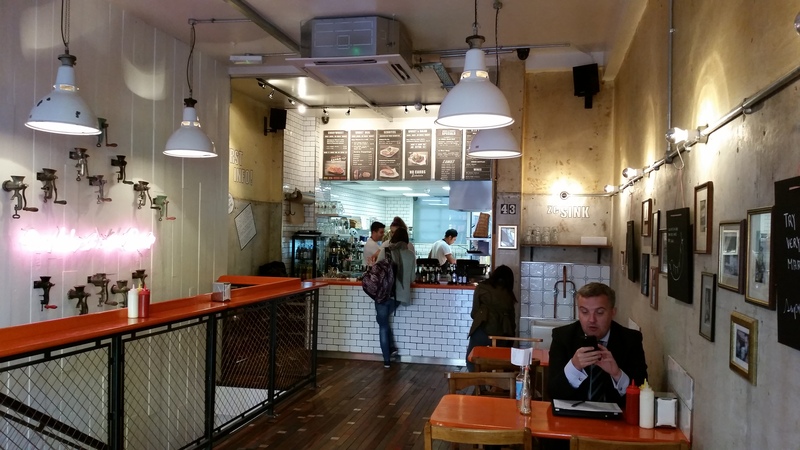 this picture was taken just slightly past twelve before the lunch crowd came in, but soon after that a steady stream of customers were coming and going, many doing takeaway while others sat down for a quick and casual bite. 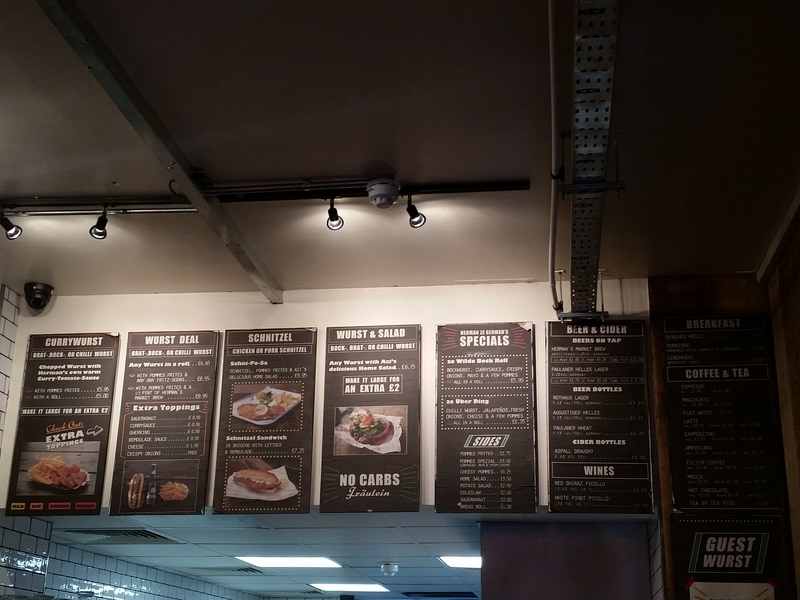 i opted for just a bratwurst in a roll, while my friend went for the same but as part of the wurst deal – for £4.10 more, you get fries and a drink. the bratwurst roll looks (and actually is) very simple, almost like something i could put together myself as long as i have the right ingredients, so i was very pleased when i discovered that it tastes more special than it looks! 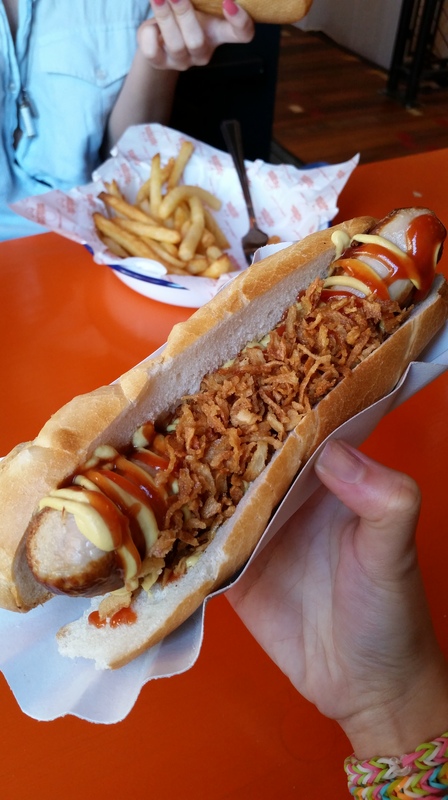 my favourite part of the roll was definitely the bratwurst – a finely minced pork and veal sausage. it was grilled to perfection and gave a loud satisfying crunch sound each time i bit into it; the outsides were crisp while the inside was succulent, juicy and very tasty. the crispy onions were the next best part – they added a super satisfying crunch and tastiness to the roll; i’m definitely going to ask for plenty of this when i return. golden brown goodies sitting atop the super sausage drizzled with ketchup and mustard and enveloped by a warm, soft and fluffy white baguette, this made for a really satisfying hot dog meal. as for the fries which you see in the background of the picture above, they were pretty good! freshly fried, warm, crisp on the outside, tasty, and yummy when had with a healthy dose of ketchup, mayo and mustard. the best part about them is that they’re healthier than regular fries because they are air-fried which means very little oil is involved and this was evident in the lack of grease on our fingers even after greedily attacking them pommes frites with our bare hands. we were so pleased with our wursts that after polishing off both our rolls, we decided to order an additional currywurst to share. 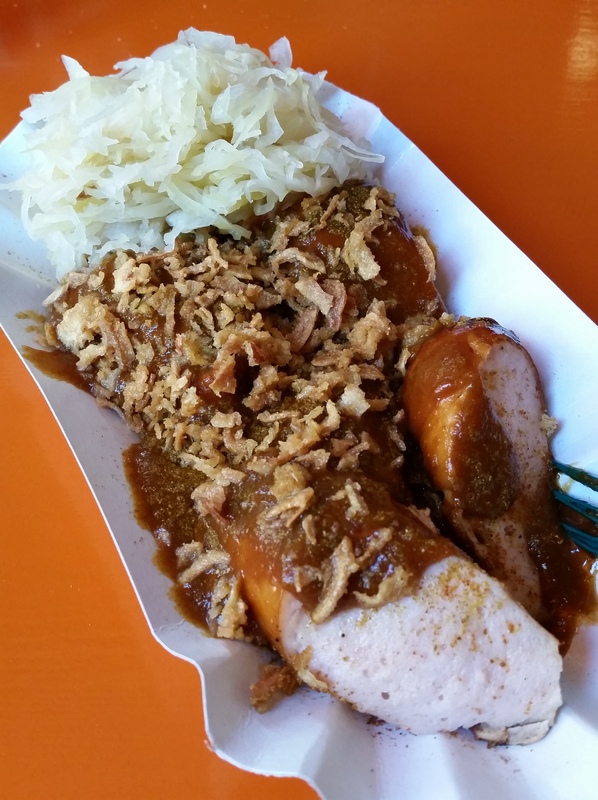 for the currywurst, you can choose from 4 levels of spiciness for the sauce, and any wurst to go with it. since we’d both had bratwursts in our rolls earlier, we opted for the bockwurst here. the bockwurst was a smooth and slightly salty smoked pork sausage. compared to the bratwurst, the bockwurst sausage itself definitely had a stronger flavour to it. it also seemed to differ in texture – the bratwurst seemed a little crunchier and chunkier (but it could also have been because this was doused in curry sauce?). we had the third highest level of spiciness for our curry sauce, and it was yummy and packed a sufficient punch. it was more sour-ish than spicy though, so i might go for the spiciest one in future. the curry sauce was thick and tangy, a perfect complement to the sauerkraut on the side as well as the remaining fries we had, which we used to mop up every last drop of the sauce. again, a generous serving of crispy onions was icing on the cake. herman ze german runs like a fast-food joint, so service is not only friendly but also really quick and efficient. it is perfect for a quick lunch, but also suitable for something more leisurely given the ample seating space and large and comfortable tables. the food is good and prices don’t burn too large a hole in your pocket, though i felt that £8.55 for the wurst meal was quite steep and there are several other good meal options around for that price. nevertheless, i’ll definitely be back when a wurst craving hits! ze wurst is yet to come. prepare for ze wurst. zis wurst is ze best.